SEATTLE, Wash.—A few years ago, I worked as a naturalist on boats in the San Juan Islands, in northwest Washington State. I was lucky enough to watch the resident orca pods, named J, K and L in the wild with all of their unique natural behaviors. Orcas are a particularly fascinating animal to study because of their social complexities. They live with their mother and her family their whole lives and each family has their own “dialect” of calls. Scientists have made the case in peer-reviewed journals for the existence of culture in some cetaceans including orcas. 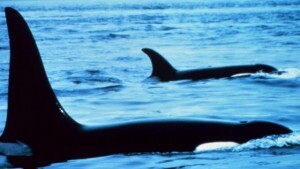 Groups of orcas can share the same habitat but not interact with each other at all; the salmon-eating resident pods don’t intermingle with the so-called “transient” orcas that prey on marine mammals, yet they are regularly found traversing the same waters within days or even hours of each other. As far as scientists can tell, they are the same species, yet they avoid each other completely and stick with their own cultural diet preferences religiously. Whether on a boat or from the shore at Lime Kiln State Park on the west side of San Juan Island, I was able to observe the orca’s behaviors. Breaching is one of the orca’s more dramatic behaviors, where it propels its full body up and out of the water, then lands with a great splash. Another unique behavior is called spy-hopping, where the orca sticks its head up and looks around. There are also many subtle behaviors to observe. Sometimes I’d see a whale just floating motionless at the surface, or “logging.” It’s not often that you can hear an orca’s calls above the water, but on that day, I was lucky enough to hear a nearby logging whale vocalizing from the surface. Was she aware that humans could hear her? Was she perhaps trying to engage with us in some way? I couldn’t help but speculate about what might be going on in her mind even though I realize that her vocalizations probably had nothing to do with humans despite my “wishful thinking” that she was trying to communicate with me. One summer, a few Southern Resident orcas started a fad of carrying a salmon around on their heads. One whale started it and soon, all of the “cool kids” were doing it. It didn’t seem to be hunting practice or serve any practical purpose. Was it a game to see how long you could carry the salmon without dropping it? We don’t have definitive answers at this point. Another example of unique orca behavior involves a “rubbing beach” used by Northern Resident orcas. The beach is located at Robson Bight in the Johnstone Strait region of northern Vancouver Island, Canada. Pods of orcas visit the area and spend time rubbing their bodies across the smooth pebbles just below the surface of the water. Why do they do this? We can’t say for sure, but it could feel good to the orcas, much like a day at the spa. There are health benefits to massage for humans, so perhaps the orcas have introduced a similar concept here. People have long speculated that there may be a rubbing beach used by Southern Residents somewhere, but if there is, no one has proof of it yet. In fact, I don’t know of any other orcas that have a rubbing beach like the Northern Residents. Perhaps it is a unique component of their culture, kind of like here in Seattle where we wear our polar fleece jackets to everything from a hike in the mountains to a fancy dinner downtown. Though humans and orcas are very different species, what affects us also affects the orcas and their natural environment, and unfortunately their environment has become significantly altered over time. The environmental problems affecting Puget Sound and the waters throughout the world can seem overwhelming, but luckily I am a part of a culture at the Seattle Aquarium that values conservation and marine life. Culture is an important part of what it means to be human, and I think it’s pretty cool that we share that with orcas. Oh, I just love that salmon on the head game. Hours of entertainment! Great post! Prev Puget Sound Orca Poop is a 'Treasure Trove' for Researchers Next Herbicides: Help or Harm?